A torn paper metaphor brings non-zero baselines to your reader’s attention. This intentional design flourish is inspired by one of data visualization’s pioneers who, 100 years later, is still showing us how to do more with data. The zero line is essential to bar charts 📊, which link total value to total height. William Playfair introduced this rule in 1786 using a stack of coins metaphor¹. If a man stacked all the coins he made at the end of each day into a new pile, then he would be able to see time, proportion, and amount all at once simply by looking across all of his stacks. Pierre Levasseur poetically referred to vertical bar charts in 1885 as columns of stacked facts². In either case, you have to see the whole stack, i.e. the zero line, to have an honest look. We sometimes omit the zero line on line charts 📈 when our interest is in the absolute, not relative, amount of change. 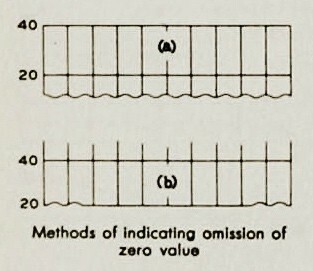 In this case a non-zero baseline appears (in the cartoon above, 50). This is familiar to many as the movement of a stock price over time. We like zooming in to see detail. It is bad practice to accentuate this non-zero baseline because that implies undue importance. Instead, today’s standard practice has us style all non-zero lines the same way because they all share the same significance. Design mirrors — and conveys—meaning. A torn paper metaphor helps. A jagged or wavy baseline calls to the reader’s attention: This is not a reference line! It alludes to the zero line, offscreen, by showing that only part of the scale is on display. The wavy baseline is intentional. It is forward. You might even say it is more honest. Brinton’s wavy lines³ are not an accidental fluke. They appear in many more examples and their use is detailed in the chapter “Standards for time series charts”: When the zero line is omitted, this is one method of indicating its absence. Brinton even includes a variant, a straight line waved at each end, pictured here as method (b). Data visualization, and graphic computing generally, has made great hay from pictorial metaphors that mimic the real physical world. By linking abstract concepts, like deleting a file, to real-world objects, like the 🗑, we make the strange more familiar. Designing with worldly metaphors in mind, such as bar charts representing stacks of stuff, can help us produce visualizations that are more accessible, and more meaningful, to all. The torn baseline example above was brought to my attention by Jason Forrest. 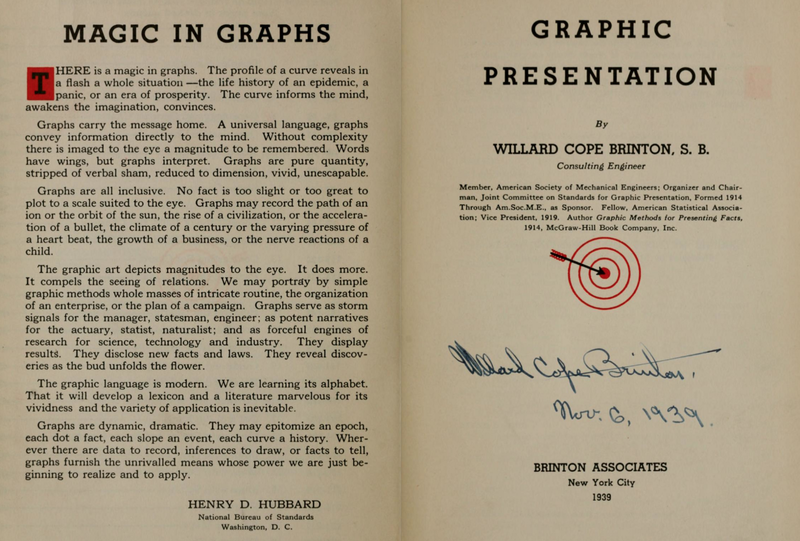 He shared it in a Data Visualization Society thread about historic visualization. While we certainly delight in appreciating the craft of those who showed before, I believe our interest has a practical undertone. Historic practitioners faced the same challenges we do today: Data overwhelmed their capacity to manage it. The audiences they had to inform were lacking in graphic and numeric and statistical literacy. Yet, historic practitioners worked to meet these similar challenges in totally different contexts. They had different tools, different constraints, and different advantages compared to modern practitioners. It is the intersection of such a similar pursuit with such different conditions that produced so many interesting solutions. Many of their natural solutions, like the torn baseline, are less likely to emerge in today’s digital environment, where we work under own unique constraints. Certain creative paths open at different moments in history. I am so happy to have learned from this example and am excited for the future discovery of more past solutions. It excites me to return to Brinton—and the many who inspired him—and keep looking. ☞ RJ Andrews is a data storyteller and author-illustrator of Info We Trust. : Levasseur’s original text is “ Les colonnes de faits empilés.” See the original essay “La Statistique Graphique” in the Jubilee Volume of the Statistical Society (1885). Link. 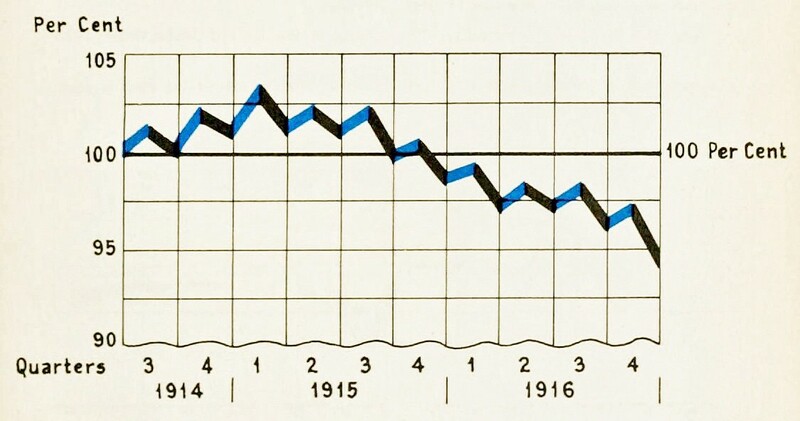 : Of course, the lessons from this single Brinton example do not have to end with the wavy baseline: note the beautiful year-quarter labels, accentuated 100 Per Cent line, and use of color to show change in data. ☞ Thanks to Jason Forrest & Elijah Meeks & duncan swain & Alan Wilson for contributing to the original enthusiastic discussion about this design.